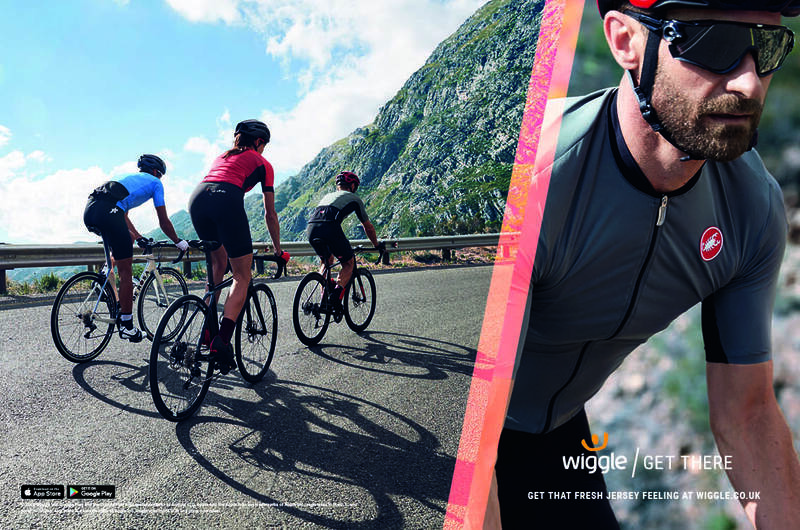 Wiggle today unveils the global relaunch of its brand as it continues to refocus its multi sports offering. Over the last year, Wiggle has undergone extensive research and customer consultation to reveal the insight that unites us all in sport. It’s that abstract feeling, unique to an individual – that rush of satisfaction, of pride, of commitment. Whatever that feeling is, it’s about doing your sport to re-live it. Wiggle talk about that intimate feeling through the language of GET THERE; a new positioning for the brand. The goal of the positioning is to drive reappraisal of the brand and its multi sports offering amongst existing customers and marks a significant effort by Wiggle to drive mass awareness of their brand via TV for the first time in two years. The integrated campaign is fronted with a new cinematic TV ad that brings this philosophy to life and captures how cyclists, swimmers and runners GET THERE, supported across social, with a print and PR campaign running across major sporting titles. The revamp of the brand also includes the introduction of a more contemporary style and upgraded onsite experience featuring authentic imagery. Dan Staples, Director of Brand Marketing at Wiggle says: “Our customers have all experienced ‘there’. At Wiggle, we want to facilitate that feeling, providing them with the gear, advice and inspiration to arrive at that destination. Discover more about GET THERE. Founded in 1999 in Portsmouth, UK, Wiggle is the world’s largest online cycling and tri-sports retailer, serving customers in over 100 countries. Wiggle’s vision is to be the world’s favourite retail destination for sports enthusiasts. Whatever your motivation or ability, Wiggle are for those who’ve made a commitment to cycling, running, swimming and fitness. And Wiggle recognises that ultimately our audience are chasing a life affirming feeling. Wiggle works with a range of Cycle to Work scheme providers and supports a large number of sporting events and activities including the Wiggle Super Series sportives. Wiggle’s design and development team is responsible for brands that include dhb, Prime, Vitus and LifeLine and Wiggle works with key partner brands such as Castelli, Shimano, Endura, Adidas & Under Armour. The company is proud to stock the best products and biggest brands, and many have been tried and tested so can be recommended by its employees. This press release was distributed by ResponseSource Press Release Wire on behalf of Brandnation Integrated Ltd in the following categories: Men's Interest, Health, Leisure & Hobbies, Women's Interest & Beauty, Sport, Consumer Technology, Business & Finance, Media & Marketing, Retail & Fashion, for more information visit https://pressreleasewire.responsesource.com/about.